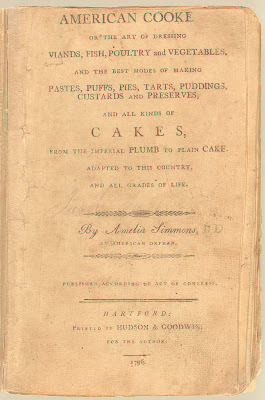 Just 20 years after the United States won independence from England, Amelia Simmons published American Cookery, the first cookbook published in the United States and written by an American. In American Cookery, one finds recipes featuring staples of North American food ways: corn, cranberries and turkey, and the first printed recipes featuring cornmeal. The library has a number of editions of the book, including the second edition held in the Rare Books Division and other more recent facsimile printings in our General Research Division. One can also find the book electronically through the Early American Imprint Database or through Michigan State University's wonderful digital archive Feeding America. Put fifteen yolks with half a pound butter, melted, grate in the rinds of two Seville oranges, beat in half a pound of fine sugar, add two spoons orange water, two of rose-water, one gill of wine, half pint cream, two York biscuit or the crumbs of a fine loaf soaked in cream, mix all together, put into rich puff-paste, which let be double round the edges of the dish; bake like a custard.